Last Friday wound down a reasonably hectic week. It was the first week back from a vacation, which tends to lump up all kinds of things that would never have been so important if I hadn’t been unreachable for 6 days. But, things returned to a relatively even keel by Thursday, so I was able to scoot away early and head to the east bay. Of course, the secondary benefit was bopping around the RBWHQ&L, seeing what prototypes could be spied and enjoyed. Alas, the newest version of the Hunqapiller was wheel-less, but Keven took the time to talk about the special mid-tube lugs they’d had made for the “splayed” (my phrase, not theirs) tube arrangement. As noted in the flickr image, there will be bottle braze-ons with the final version, but I think the geometry and most of the hard-wiring is mostly in place now. The Hunqapillar is truly a versatile and sturdy beast. 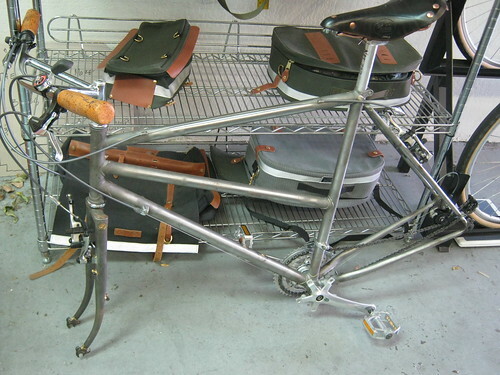 The fork braze-ons alone are, shall we say, extensive. I’m pretty sure that this bicycle could handle anything most folks could throw at it. I think it will also balance better once they set up the left side drive. The stuff behind the Hunqa-proto (Proto-Hunq?) got me focused a bit on luggage and bags. Now, in case I’ve never mentioned it before, I’m kind of a bag junkie. Well, maybe “junkie” is a bit strong. I have some pretty firm tastes and requirements, actually, formed through a few years of working as a buyer of such things. For me, a bag has to be well sewn, useful in design without being overly specific, and should work quietly for a long time. If it turns out to do one or two things not originally envisioned, even better. The work that has gone into the Brand V bags (Vegan, “Holier Than Cow” as the logo says) is pretty considerable. 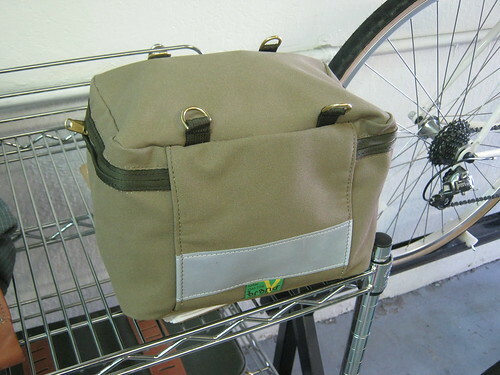 The Brand V BoxyBarBag is a pretty simple, bar-mounted squarish handlebar bag, which mounts without hardware to the bars. With the strap support system, it locks down pretty danged well. I didn’t have the opportunity to bounce it around on the trails, but it certainly survived the bounce ‘n wiggle test on the showroom floor. For the amount and quality of the sewing (in the US! ), it could easily cost more than the $75 they charge for it. Here, you’re looking at it from the front, without it being on a bike. Nice big flecto-patch, too. 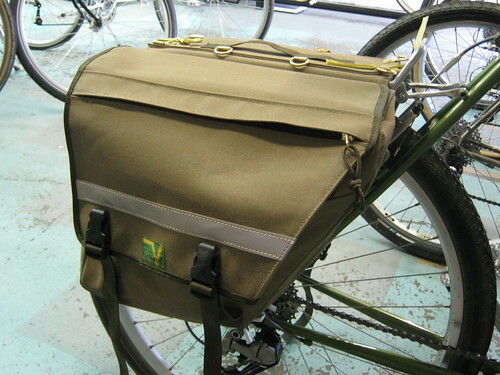 There was also a set of the new BrandV Panniers set up on a Sam Hillborne. I played around with these for quite a while, trying to figure out how I could justify buying them. Simple, sturdy construction. Everything you need and nothing you don’t, as the saying goes. They also seemed to invite further modification, with a set of D-rings on the top mounting area. But, one real beauty of the design is the dust/water flap, which seems to lend itself well to separating the load, or handling over-stuffing. Again, excellent sewing work throughout. I really liked the shape (formway?) 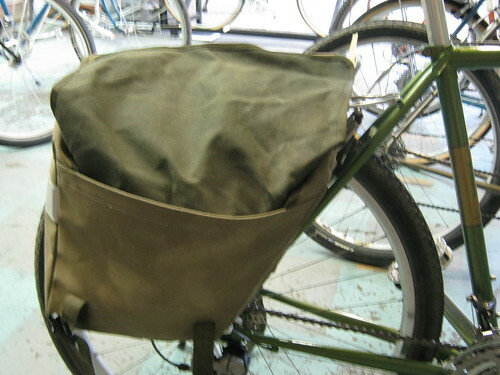 of the panniers as well. Heel-strike be damned! 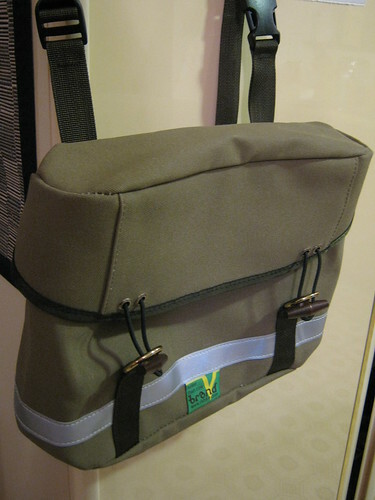 The bag which really caught my eye and followed me home was the GrabSack, another in the BrandV line. 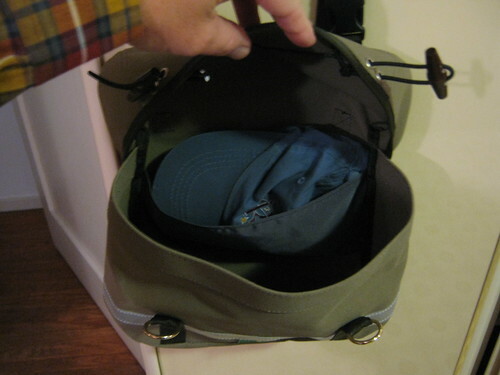 The slick trick which Grant shared was to convert it from a shoulder strap to a waist pack setup. The strap can be shortened from both ends, so with a quick slide down and a two-handed cinch, it nestles easily into the small of your back or off one hip if you prefer. I’m not going to make a movie of that move. It’s something you can figure out pretty quickly if you mess around with it. Anyway, US-constructed. Under $50. It’s kind of a ridiculously good deal. Especially if you like bags. Which, as I mentioned, I do. *For you youngsters out there: Broken Record = Repeating CD = Recursive MP3, i.e. something that says the same thing over and over. I started this list a while ago, but just came across it doing a search for another document. Just wanted to append the updates before I forgot to do so. I’ve also put an asterisk (”*”) by those models which have been retired, or are no longer available. In winter, it doesn’t take too much to get the various bike-geek lists lit up (and I say that with love, since I admin one of them myself…). which was interesting enough by itself. This was a bit more interesting, clearly showing that something of a collaborative nature was in the works. Could it be the rumored SOMAdell A. Homer BorneFoy Atlanticabombaluki Roaday-ay-ay-OH? Some felt that obviously it was, would be or could be. Others felt the fork was clearly a disappointment. It was instantly an internet star. “It’s what used to be called a road-sport bike. It has light tubing (by our standards — like the Rambouillet, A. Homer Hilsen), and accepts tires up to 28mm with a fender, or about 35mm without. 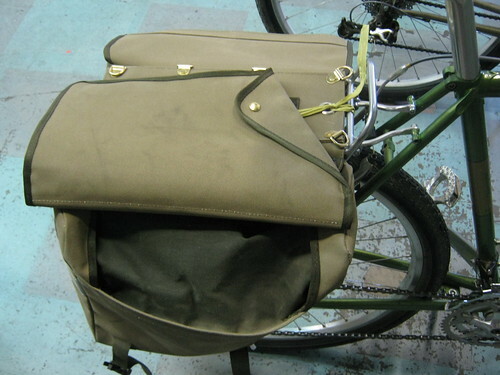 It has two eyelets on the rear dropouts, one on the front, and hourglass mounts on the seat stays. 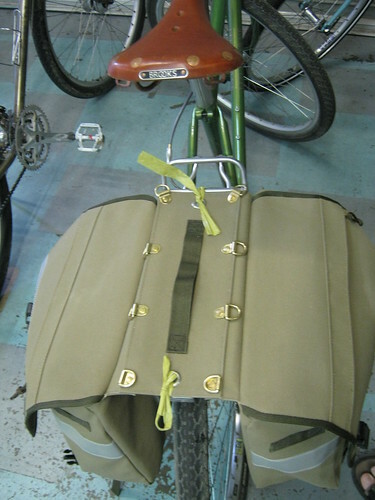 It’s not for loaded touring, but fits a rear rack anyway, and you can use that as a saddlebag support, or put a trunk rack or some other light load on it. It probably won’t break-like-carbon if you load it up and head for the hills, but it’s really not built to do that fantastically well. The tubing is too light. It has the same “expanded” kind of frame as the Bombadil and Sam Hillborne. The top tube slopes up about 6 degrees, so ultra classicists will barf, but the upslope forces you to be comfortable, and some people must be forced. It also means you’ll ride a frame that’s three to five cm smaller than what you’d ride in one of our bikes. The fork is threaded, so you can use a quill stem. All the lugs, the crown, and the BB shell are the same ones we use on our own bikes. The rear dropouts are a stock model that have been used on lots of frames, but I didn’t pick them. They’re small, strong, and light. The tubing is Tange Prestige (heat treated CrMo). 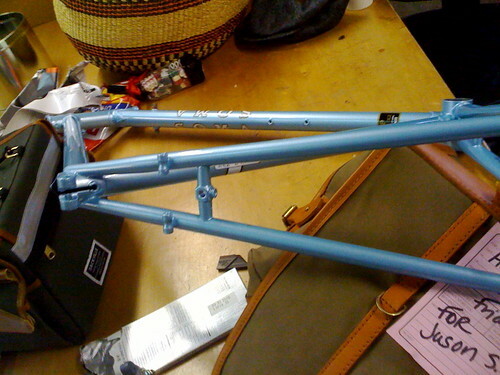 Tange is a tubing maker; Prestige is it’s top, heat-treated CrMo tubing, and it’s plenty good for any frame. 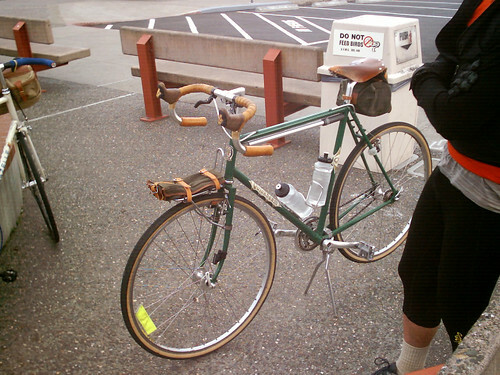 The downtube says the opposite of SOMA, and the model nameSan Marcosis in small letters on the back of the seat tube. 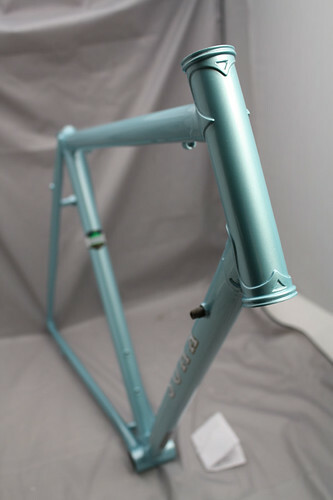 I think it’s best and fairest to evaluate this frame in the context of the current bike shop selection, and the price, about $895. 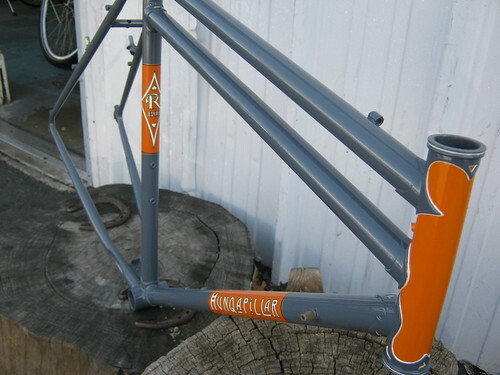 I want to say that, because if all you do is consider “lugs” and “steel” and “fork crown” and maybe even “Rivendell-designed” it’s a short step away from being compared to frames that cost a whole lot more. Please DO compare it to any carbon frame and fork. Compare the clearance, the bar height and comfort, the tire and fender clearances, and the overall look. DON’T compare it to an A. Homer Hilsen, etc., and expect the same details. The fork won’t be as beautiful, but it’ll look a whole lot better (by certain standards) than any carbon fork, and it’ll be way safer, too. This frame is perfect for anybody who wants a really nice, super comfortable, attractive, safe, and versatile bike for well under $2,000. It’s great for any road rides, centuries, and (with 35mm tires run soft), some smooth fire trails. Sizes: Probably 51/650 or 700c (not sure); 55, 59, 63. Maybe a 47/650, too. It’s designed, but nobody ever buys small bikes, so I may suggest to Jim to nix it. It’ll be up to him, so don’t get mad at me…. Fitting: Go three to six cm smaller than your level-top tube frame. Brake style: 55 reach, sidepull or centerpull, but there’s no cable hanger stop, so if you want to use a centerpull you’ll need the stops and hangers, and I’m sure Merry Sales will make them available to dealers. Max tire no fender: 37mm. Braze-ons: Two bottles, two eyelets on rear drops, one on each front, plus the normal cable stops. Designed for: Road riding, light loads. If you’re light or if you ride light (don’t smack things, pedal smoothly, unweight the bike over bumps, things like that), you can go glorious unpaved places on this bike, but the bottom line is: Road bike, not trail bike. Loaded touring? : Nope. It won’t break, but it’s not touring-stout. Kinda tubes: Tange Prestige, with 0.8mm butts in the top and down tubes. Anything quirky, weird, or spooky that you’ll find out too late? No, it’s normal. Frame weight: Shouldn’t ask, but a 55 will weigh about 4.4lb. Available where: Bike dealers who opt to stock it, and Rivendell. How, oh how will we make it until 2011…? One of the really inspiring and gratifying things to come out of overseeing the Rivendell Owner’s Bunch list has been watching folks find one another and set up local rides. The SoCal Rivendell Riders have seemed particularly adept at gathering up and down the SoCal coast - I think they managed 12 or 14 monthly rides to date. I keep hoping to schedule a visit to my sister at an opportune time, so I can attend one of these rambles. Ok, there’s a resolution for the new year. Up here in the SF Bay Area, we are perhaps a more clannish bunch, as those types of Riv-oriented get-togethers have not occurred with the same frequency. Though, given the geographics of region, maybe you are more likely just to run into another while out and about. (Granted, I did miss the ride back in October). So, when SCRR riders Esteban and Aaron announced they’d be up in the region around the New Year, making the ride became a high priority. Couldn’t swing the mid-week ride, but cleared myself the Saturday just fine, which is why I found myself muttering minor curses at 8 am or so, realizing I’d left about 10 minutes late after a few last scattered tasks at the house. All was not lost, however, as JimG checked back in via communicator to let me know that most folks had really just gathered, and one of the riders had to deal with a flat. 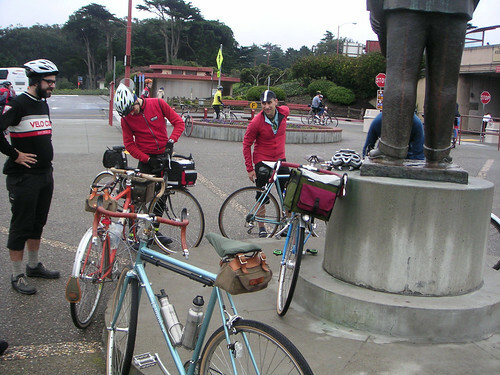 When I rolled up to the Strauss statue at the south end of the Golden Gate Bridge, it was pretty evident which group was mine. 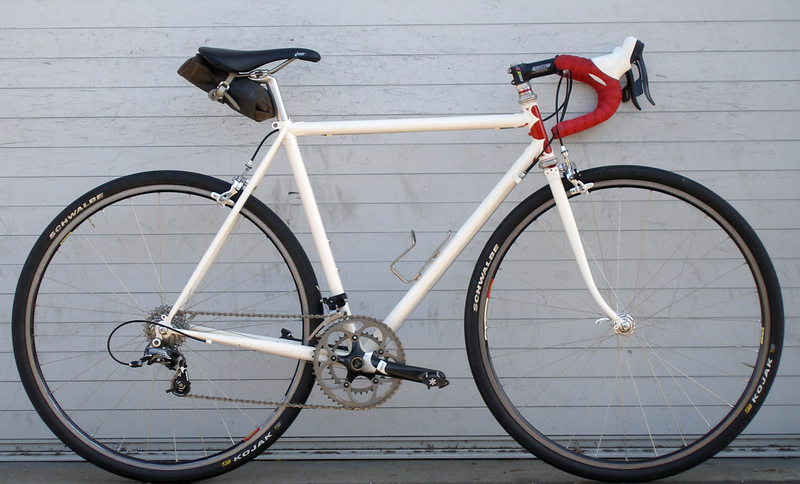 Wool, steel, lugs, tweed, canvas, twined bits and big ol’ road tires. These were my people. 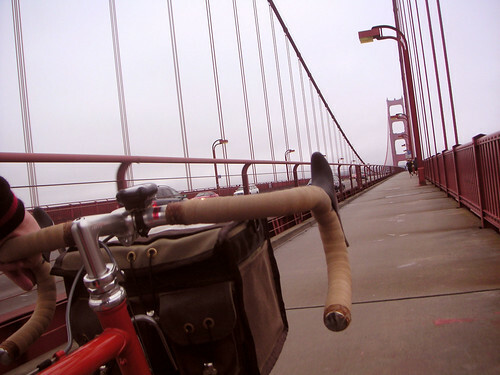 We introduced ourselves around, oohed and ahhed over one another’s bikes, and then headed north over the bridge. 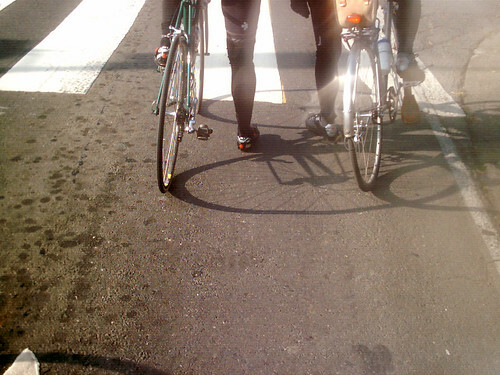 Fell into an easy rhythm with JimG, and we realized we’d not ridden together in waaaaaaay too long. In fact, I think there some rumors flitting about the tubernets that we were, in fact, the same person. While there has certainly been a preponderance of Jims about, it’s important to quell such rumors with periodic public appearances. 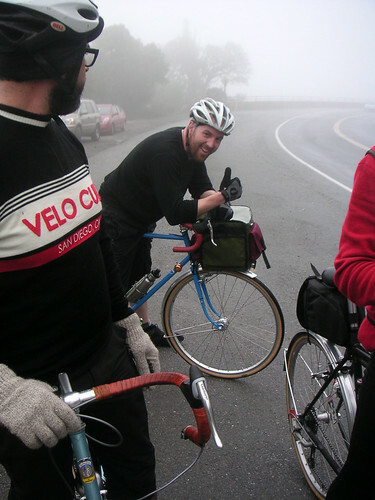 The clouds dropped lower as he hit the Camino Alto climb, with visible mist in the air. The flat gremlins chose this moment to bite into Aaron’s front tire again, and he was again forced to change tubes. At first he took this as a sign to head home, but we talked him out of it after taking a tube and patch kit count among the rest of us (more than some small bike shops). We hung out as the mist came down, watch a few packs of all-logo-all-the-time groups go upwards on the hill. Other than a single Pinarello tacked onto the back of one gang, they were all devotees of the Church of Carbonium. They also had Occultorotaphobia - fear of the covered wheel. Back when were gathering at the statue, I’d asked Esteban if he knew what Latin was for “covered wheel.” He allowed as how though he was a professor, he was not a Latin professor, and the question remained unanswered (until I started writing this and looked it up). I nattered on for a while about the consistent parade of folks I’d seen on the way down who were fenderless, until it occurred to me that the only folks who where not running fenders our group were Esteban and Aaron. Since I didn’t want to be a flippant host, I tried to let the subject drop. I think there are four main regions of fender culture in this country - (1) The Pacific Northwest, where fenders are assumed, and if you don’t have an extended fender with flap that scrapes the ground, no one will ride with you (2) Most of the rest of it, where if you want to roll out the door every day to ride with a minimum of fuss, fenders (or at least a fendered bike) is a good idea, (3) the SF Bay Area (and a goodly chunk of California), where fenders go on in November and off in March, and (4) SoCal, where fenders are simply not necessary. In short, Esteban and Aaron are totally off the hook with respect to need for fenders, which really do complicate things when trying to pack a bike for travel, anyways. But, it cracks me up when I see local folks out on road rides, tattooing themselves with reverse skunk-stripes courtesy of the road grit flung upwards from their 23 mm tires. Mind you, I’ve done it myself many once upon a times, and there’s nothing like starting out into the rain and sensing that first feeling of damp cold seeping into the back of your shorts - a feeling you know will not leave until the ride ends. Of the many, many bikes that went past, a mere handful had even a spray guard, and I think only one (a mtb-ish Cannondale sporting drop bars heading south) had a proper rigged set of fenders. I mean, it wasn’t like the day had started out sunny or anything. Aaron rejoined us and we pressed onwards. 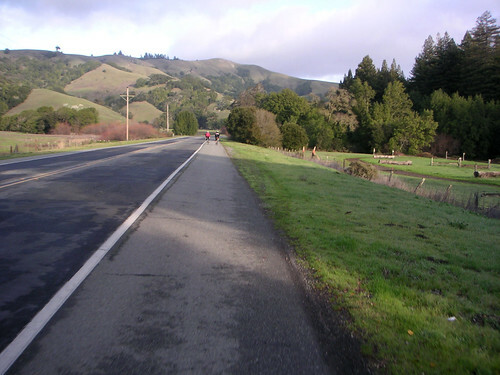 It was still holding air in Larkspur as we rolled past the Village Peddler, but by the time we made the left turn towards Shady Lane in Ross, he was running about half pressure. He took that as a further sign - unfortunately the old “third time’s not a charm” - peeled back towards Breaking Away Bicycles in Ross Commons, and bid us to continue on without him. This time we honored his wish. We paused for a damp refueling at the Java Hut in Fairfax. One of the things I appreciate about riding in Marin County is the opportunity for glimpsing cycling royalty*, and in this case, Otis Guy was hanging out under the awning with a couple of friends, clearly having just finished off a ride. He commented a bit on our setups as we settled in and pounded down some calories and caffeine. White’s Hill and thickening fog beckoned to the west. *It should be noted that said glimpses involve those folks actually riding their bikes. As we hit the initial incline, “Oh-you-know-I-haven’t-really-been-riding” Adam rocketed forward on his fixed Pelican. At first it seemed he was going to leave us in the dust, but then he pulled over and set up for some excellent climbing images. My eyes crossed a bit as I tried to keep up with JimG and Esteban, who kindly pulled up near the summit for a regroup in the fog. At this point, Bradley decided to head back to the City, as he had to connect with a friend. 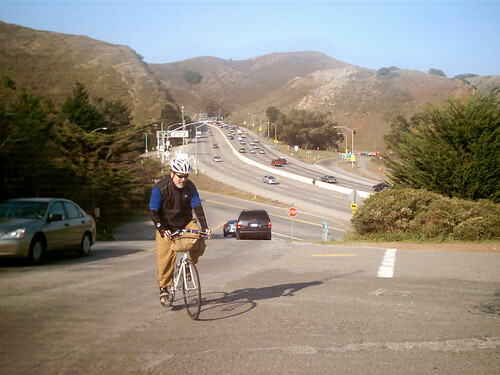 If I caught it right, it was his first time that far north of the GG Bridge, and hopefully I’ll see more of him on the roadways now and again. 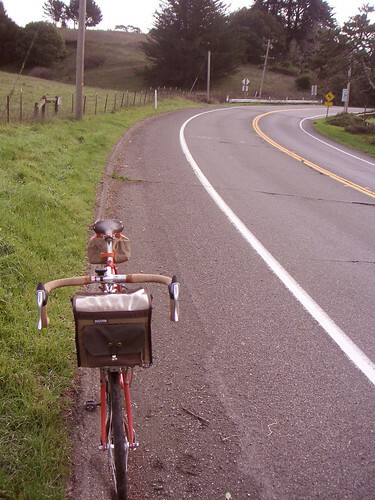 Still maintaining drivetrain parity, we pressed on into San Geronimo Valley. Encouraged by gravity during the decline, I got that good feeling and pressed onward through towards Lagunitas. I don’t know if it’s having the White’s Hill behind us, but for some reason things often feel strong for me there. Esteban connected up, and we buzzed along, skirting sharp rocks and trash cans until the road narrowed before the turns began. 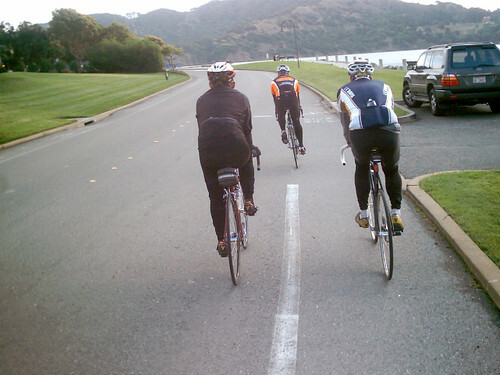 We caucused briefly, and decided to stick to the pavement of Sir Francis Drake - probably one of the oldest stretches of oddly improved roadway left in the county - rather than veer onto the unpaved section of the Cross-Marin Trail. The old concrete of the road has been reconfigured and patched, but once inside Samuel P. Taylor Park boundaries, it remains an esoteric reminder of driving along the river in your 1947 Hudson. Depending upon the attitude of the autos, it can be a wee bit sketchy, but a fair amount of rain had fallen here on New Year’s Day, and things felt even more damp in this narrower and more wooded section. Rather than splatter mud over all of us unnecessarily, we went straight at Inkwells Bridge, did a little coffee shifting at SP Park and caught the paved section of the Cross Marin Path. Here we were able to spread out a bit and chat, snap excellent photos of one another and enjoy the first inklings of sunlight we’d seen all day. 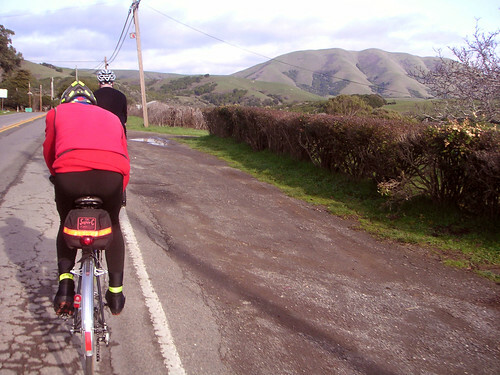 We chugged our way up the soul-crushing incline to Bolinas Ridge and dropped down to Olema. At this point, I must admit that I was becoming a little fixated on food. The Sirens on the rocks at Bovine Bakery sang so loudly that I neglected waiting at either the Ridge or at the stop sign in Olema. So, it was with some embarrassment that I realized no one else was near me on Highway One. It felt good to stretch a bit at this point, but it did little but underscore my poor host-y-ness. Esteban, Adam and JimG rolled up, the latter not sure if we’d taken the Bear Valley Road option. Luckily, he’s ridden with me enough to know my beeline-to-Bovine tendancies, and had chosen wisely. As we unsaddled and tethered our mounts in town, it suddenly dawned on me that the already seated rider who had said “Howdy” was indeed One Happy Cog. It was indeed a day for Flickr-interactions, as we’ve chatted and commented through that medium for a while. I’d met him once before, back at the Marin Century, and we enjoyed pizza, baked goods, real sunshine and each other’s company for a while. 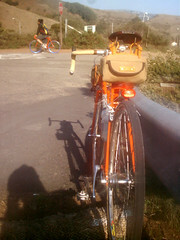 And of course, more bike-geeking, as he had ridden his Eddy Merckx, which we had to enjoy. About the time we realized that we still had to ride back, Aaron suddenly appeared on the roadway. When he stopped in the bike shop back in Ross, he and the wrench went through the front tire with a dental pick and magnifying glass, removing all errant shards of glass before wrapping things up and sending him on his way. Reinvigorated, he decided to set off after us. 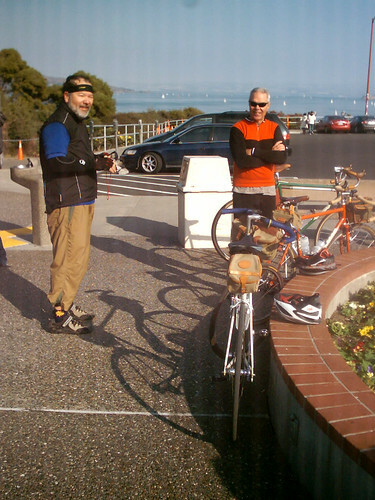 Despite the fact it threw the balance back in favor of coastable, many-geared bicycles, it was great to see him again. We regrouped briefly at the public facilities and headed out, JimG going one way and me the other. JimG’s routing proved to be the superior option, and we scaled the pitch out of town and grabbed the Pt. 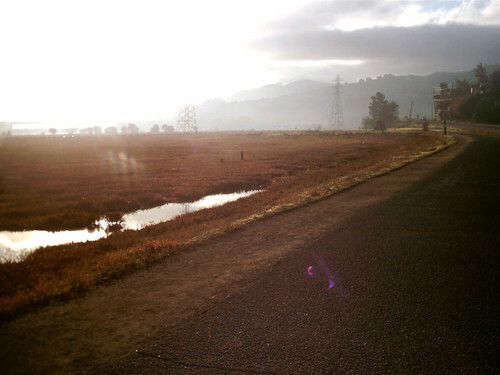 Reyes - Petaluma road for a while. 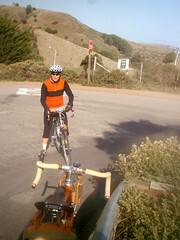 We cut back towards the Cross-Marin Trail again, enjoying the greening hills and rural landscapes. There have been enough rains to reinvigorate a bit of growth, without making things excessively sloppy. Once on the trail, opted to slog through the unpaved bits rather than duke it out with the vehicular traffic returning from the coast. The worst part was the first half mile or so, with sloppier mud and more leaves. As we continued onward, the terrain firmed up again and I realized why Aaron had caught up to us - the man could move his bike pretty danged well. We ended up on the Inkwells Bridge awaiting the rest of the gang. I was a little worried they’d hate me forever for dragging them (figuratively) through the muck, but there were mud-flecked smiles all around when the rest of the gang rolled up. Back on the roadway, we retraced our path of earlier in the day. By now, the clouds had moved off, and the light played beautifully in the San Geronimo valley. Esteban, Aaron and I rolled along just fine for a while, and then I heard a couple of knocks from the pistons and they eased away. It was definitely one of those “keep pedaling, things will get better” moments. Shifting up around on the saddle into the climb seemed to help a bit, and we regrouped again at the top of White’s Hill, collected the rest of the gang and then plunged downward. The descent can be a little hairy, but we timed it pretty well against the cars and everyone swooped back towards Fairfax. After a short mixup as to the whereabouts of Adam, we all gathered once again at the Java Hut, this time in the waning sunlight. Double-E’s all around (well, I think Adam had something more fluffy) and then I decided that it was late in the day enough for me to vector homeward rather than tagging along to the bridge once more. Adam had connected with his wife who was nearby and planned to take advantage of the conveyance. JimG agreed to ferry them onward through the rapidly increasing dusk, and after a round of “Great riding with you’s”, we went our separate ways. By the time I hit home, I’d notched about 82 miles. Now, that was a great way to greet the New Year. Here’s to MMX! Had that realization last week as I rode home from work - it wasn’t that late and the sun wasn’t hitting the roadway any longer. Time to bring the aged NiteRider out of the closet and make sure that it still works. Then the other morning, as the dog and I worked our way around the block, came the breeze with a bit of bite. In other words, the first true breath of fall. Which is not a bad thing, certainly. Despite the layers of HVAC climate-controlled workplaces and the fact we seem able to buy spring fruit year round, the seasons still manage to create the urgency that stems from far simpler times. The nights edge out a little longer and we realize what a gift warm sunlight actually is. It also means that otherwise normal - ok, that may be a bit of a stretch - people are donning dresses and tearing around the trails in preparation for cyclocross season. This is as much a sign of the season as anything. Dried, brown grass, dust in the air and sparkly feathered boas… such is Fall in the SF Bay Area. Pilarcitos/BASP, SRCX, Surf City, LARDP…all on the schedule (even though it says “2008″) for your perusement. And more at the NCNCA cyclocross pages. But, one of the cooler things manifested quickly yesterday on the RBW Owners Bunch List - a Rivendell and Friends Ride to take place on Sunday, October 18th. The specifics can be found here. a small bit of this ride. This, of course is taking place the day after the Lion of Fairfax, which it seems my schedule will allow this year. Yay! So, I plan on being good and sore for at least the beginning and end of the Rivendell Ride. Not much update yet on things - still haven’t really felt like pulling the bits off my bike to check things. Mostly this is because I’m trying to catch up on a less-than-productive work week last week, combined with the start of a couple of classes this week. This “time” you speak of, she is an elusive creature, no? But, there are some good things to report on the meat-bits front, I reckon. Last night, I could actually see folds at my knuckle when I straighten the finger out, so it seems like the swelling is going down a bit. I’ll spare you images this time around, as now it really just looks like a sewing project gone horribly awry. The doc is pretty sure that I sprained my Teres Minor, as I have some strength and motion in certain directions and pain in other specific angles. My neck is clicking and popping a bit, but in a good way so far - more dropping into better alignment as swelling reduces. Will probably get to see my chiropractor pretty soon since he won’t be working against the tissuue quite so much. Ice has continued to be my friend. I’m really happy that the general antibiotic course is over with. That stuff was making me a bit dopey, which didn’t assist in the whole trying-to-work efforts of last week. Actually have had a few moments of sharpness this week, which never should be taken for granted. In nothing else, it would be nice to get a light ride in so I can change the beeriffic photo that has remained my most recent on Flickr since last week. Not quite sure what angle will be comfortable… Zeus with the moustache bars? Singlespeed mtb? Get the cables rigged on the Hilsen? Sounds like Saturday’s project. The announcement is pretty exciting - having refined the larger clearance for bigger tire models with the Saluki/A. Homer Hilsen/Sam Hillborne, they created a model at the other end of the spectrum. 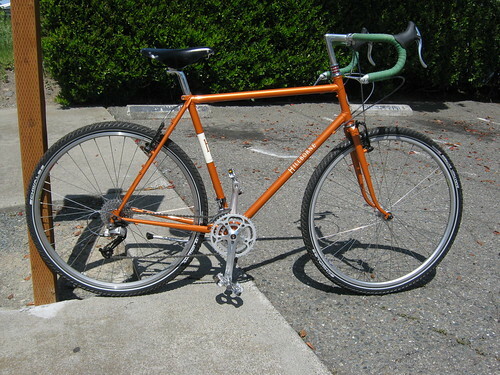 The Rambouillet had previously been their “lighter” road model, but if you read through the description, it was always thought of as a versatile road bike that wanted to see trails and trickier topography. The limit really was brake reach, which got solved first through the use of a 650B tire size (Saluki/584) and then with the advent of the Silver Long Reach brakes (A. Homer Hilsen). This meant that while the Rambouillet had a lot of attractive features and fans, it was in reality pretty close to the Hilsen - perhaps more change of emphasis than of the basic design. The other thing which gets mentioned in that post is a newer, leaner, meaner version of the Quickbeam. 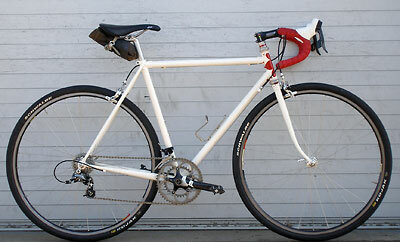 Which, if you haven’t figured out by now, is pretty much the bike I use for every type of riding. There’s something about that aesthetic of using a limited system to find a certain richness of experience. Which, quite honestly, I’m looking forward to getting back to. 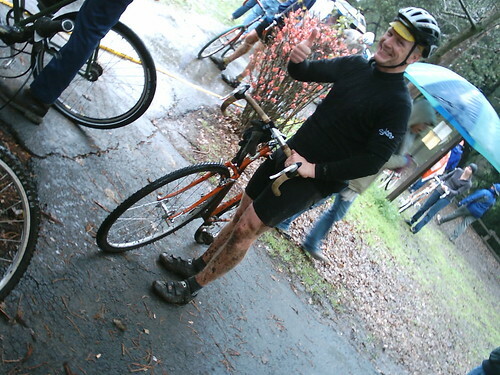 As mentioned here a few times, the Chico Hooligans had planned an offensive to the south, and showed up in force minus one for the Last CX Race of Last Season, put on last Saturday (2/14/09) in Santa Rosa by the enterprising folks at BikeMonkey.net. I hadn’t toed the line or thought about time and place based racing since BASP #4 back in November. (Scheduling conflicts had prevented a full-season attendance, causing me to miss the race at Coyote Point.) But, as any cross-junkie will tell you, once you start thinking about barriers, run ups and lap cards, the twitch sets in and you’ve gotta get your fix. The good stuff, y’know - the uncut, pure cyclocross fix - always has some weather mixed in. Oh sure, we had a little residual mud down at the Candlestick Park race. But, for the most part, the most pressing question about the weather was where to toss your arm warmers before your race, so you could find them again afterwards. It started raining mid-week or so. Big, heavy drops with serious intent. Our sump pump kicked on for the first time in months, it seemed. Then, it just kind of kept raining. And (for us) it was a relatively cold rain - snow levels were said to be below 2,000 feet. Though we probably wouldn’t see flurries, it would certainly be damp. 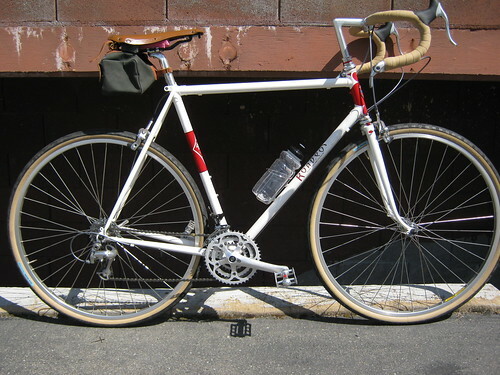 Chico Gino had come across a Vanilla Singlespeed CX bike through an incredibly serendipitous chain of events. So, he had entered in the B Singlespeed division. I decided that would be a fun way to spend the day, so on Friday night, I swapped, flipped and stripped the Quickbeam, and made it ready to race. The Hilsen was still in C. Xavier Hilsen mode, and since the second race was free, I brought it along just in case I was stupid enough to do the Geared, Old-Guys race. On race day, my wife was feeling a little less-than-perfect, not buoyed by the possibility of either (A) standing in the rain watching us race or (B) sitting in the car trying to stay warm. Against her strong protestations, I made her sit this one out and headed north with a loaded car. Which should explain the dearth of photos for this event. It rained most of the way to the Sonoma county border, then cleared to a low cloud cover, with some heavy dark clouds still threatening to the west. I got to turn off my wipers, but the steady hiss of tires on wet pavement continued to the race venue - Doyle Park in Santa Rosa. I’d never been to that particular park before, arrived at the wrong parking lot, corrected and pulled off a ridiculously fine bit of parking karma to snag a place facing the course. 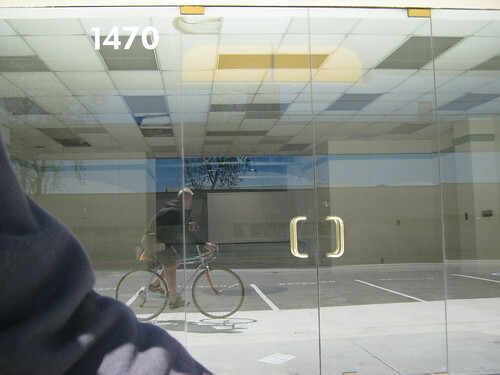 Exiting the vehicle, an orange and metal-fendered bicycle eased along at the edge of my vision. This turned out to be Claire, Gino’s wife, who had ridden over from the hotel and was tracking down the rest of the gang. They appeared quickly, and I met Paul P., Roy and Renée, who had previously existed only in photos by reputation. Gino was there, and kindly allowed me to fondle and parking lot ride the Vanilla, which was even lighter than I’d imagined and ridiculously nimble-feeling. Back on the Quickbeam, I plodded around the course to find and deconstruct the tricky bits, figured conditions would degrade quickly once tires began removing the sod, and opted for trying to get my heart rate up on the paved roads around the park. Before too long, we all lined up on the squishy wet grass and awaited the start. As B Singlespeeders, we were looking at a 30 minute race, and had to wait for the Men’s C wave to start before they released us. Someone had observed that the lawn had no idea what was about to happen to it. Gino hit the gas, his BMX-roots still vibrant and fertile. I slip-slopped a bit on the grass before beginning to thread my way through all manner of Junior B’s and C’s that started with us. They routed us on a “follow-the-concrete” parade lap to begin, and within a minute or two, we came upon a herd of brake-squealing, momentum-killing, oh-we-have-to-ride-this? folks in the C’s. Now, I bear no animosity towards the C’s. And it wasn’t like a title or a jersey was on the line. And, to be blunt, it wasn’t like I was going to win or anything. And it isn’t like I haven’t hit the brakes at an inopportune moment and heard the gasp of exasperation from a faster rider who had been behind me. But, there were obviously four relatively tricky bits on the course, and I had at least made a plan on what I wanted to do. Y’know that “perfect” line you rode during your practice lap? (You did ride a practice lap or two, right?) It will not exist for you. Sure, it’s nice to have a sense of where you’d like to be, but for the first lap or so, you need to realize that every other person in your group wants to ride the exact same slice of topography in pretty much the same way. This will lead to everyone in front of you hitting their brakes, and, in the most egregious circumstances, standing stock still astride their bikes until they get their chance to ride “their” line. Now, remember, the course exists from tape to tape, not just the smoothed line that you rode earlier. So, when you come across a tricky bit during the early parts of the race, assume two things: (A) someone will be stopped and standing right in the middle of where you planned on riding, and (B) someone will have fallen and will be lying directly in your exit line. In fact, it’s probably best to assume that you will need to get through the section by following The Worst Line Imaginable. Therefore, when you engage in your practice lap, see what alternatives you can find. Oh, and during the race, it’s ok to pick your bike up and run past people who are just standing there. As long as you don’t hit them, hook bars with them or yell at them. Dropped in, scrambled up, brought a tree with me, detached it and remounted. Then we were into the “intestine” section - multiple right/left switchbacks among trees with incredibly short straights between - a course feature which I really hate to encounter on a singlespeed, when you are among geared riders, as they are twiddling in too low of a gear and you end doing a fair amount of half-stroke, half-stroke, half-stroke then trackstand work. This was exacerbated by the quickly degrading surface of the grass, which began to turn into a chili-type mud beneath our tires. and I thought I saw the white Rock Lobster singlespeed that Paul was riding. We worked our way out of the intestines (?! ), found the only serious straightaway which led across a couple of curbs and into a broader set of switchbacks in front of the announcer and the tents. To keep interest up, the announcer was openly heckling us, and seemed to be mining the “keep-both-hands-on-that-Vanilla!” vein at Gino to humorous effect. Another switchback in front of the crowd, two barriers (a little higher than most and built to what appeared to be Mil-Spec) and another switchback, and we were heading towards the creek. Gino shot by the other way, a vision of momentum and grace. I fell in with another group picking its way to the creek area. Luckily this batch had a little better sense of purpose, and we brought some speed into the drop in, which curved left and immediately climbed back up. Well, theoretically. I found myself on a slide-for-life on a tangent to my preferred route. Slid for a while on shoulder and hip toward the water, came to a stop, got untangled and scrambled up the muddy bank. Dropped in on the next dip, came upon a bottleneck as the narrow trail constricted to a narrower set of concrete stairs. This was thoughtfully covered in sand, and had a 3″ steel pipe as a handrail at hip height, so you bang against it to constrain any course deviation. The sand, as it turned out, was a feature for the next ten or fifteen yards or so, bringing one of the endearing features of Dutch cyclocross to our fair lands. We arched around the playground, found the sand once more and then bumped up a curb and down off some concrete edge to the creek again, looped around and came up. At this point, I realized my bars had been tweaked by the unscheduled landing, so I hopped off and twisted them back. The Quickbeam began to wonder just what it had done to deserve this kind of treatment. Back on again, we hit brief pavement, then headed to the fourth creek dip, which had been the first tricky bit on the first lap. -but-for-some-reason-it-feels-better-than-pushing-pedals part, before repeating the creek dips. After the first lap or two, I was feeling pretty crappy. The mud was thickening and momentum was fleeting. Then it started raining. Which you might think was a bad thing. But, you’d be wrong. First, I’m one of those people that actually enjoys riding in the rain. Second, it made things wet rather than just gloopy, and the mud stopped sticking. In fact, it was downright refreshing. 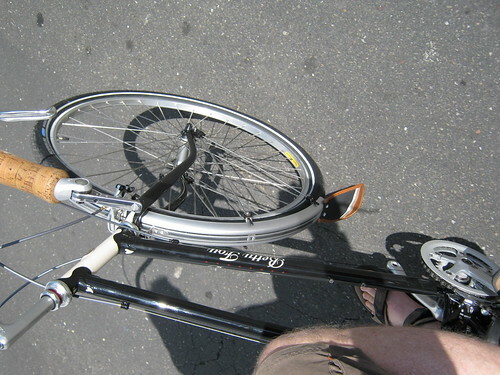 As further support for the Kent Peterson mantra “Keep pedaling, it will get better”, I did. It did. And I commenced to start catching people. There was a Legolas guy out there, and I nicked by Paul (though I had to resort to making clanky derailleur sounds to fake him out), and some other folks. I did have to wonder how much some of those full suspension mountain bikes were starting to weigh by the last couple laps. The C race leader caught me in the last curve, and so I got a free pass on the last lap. The fast kids like Gino had to finish theirs out. This was a cause for much rejoicing. Gino finished shortly thereafter, just off the podium. Nicked by someone who went on to win her “A” singlespeed race. … an altogether much less clever idea was forming in my brain. That’s pretty much all I can come up with - for some reason I’ve misplaced my CD of the first Rivendell Readers, so I can’t confirm from that right now. Any recollections would be appreciated. Thanks!